In the design plans, of the $22.2 million Tapestry on the Hudson preservation and restoration project of the old 6.5‐story “Mooradian Building “in the City of Troy, was the construction of a new elevated green space deck and playground. The elevated deck preserved valuable parking spaces for the building’s residents as well as providing a beautiful view of the Hudson river. 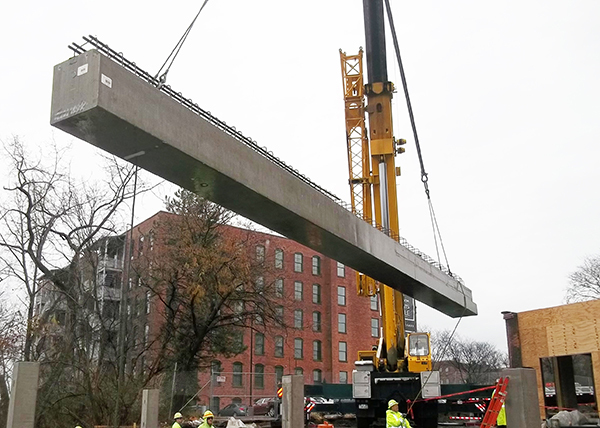 Due to the over budget original steel deck design, Oldcastle Infrastructure of Selkirk, N.Y. was selected to manufacture precast concrete components to compose the elevated deck. Working closely with the architect, engineer and general contractor, Oldcastle Infrastructure developed a turnkey, precast solution that provided many benefits. The use of precast reduced costs, saved time, and lowered future maintenance requirements compared to exposed steel. Their precast design had to overcome various challenges such as working around existing underground sewer structures and a sloping grade that impeded headroom below, the top of deck elevation was fixed by the handicap ramp maximum slope from the existing building and tight access for the trucks and a crane. In addition to a limited budget. To provide the deck superstructure, Oldcastle Infrastructure’s scope included the manufacturing and installation of precast‐prestressed beams, precast columns, prestressed composite IT and L‐beams (several with cantilever on one end towards the river), precast spandrels with moment frame connections, elematic precast hollow‐core slabs, precast stairs and landings and precast walls. It took Oldcastle Infrastructure field operations only five days to erect the deck superstructure. Tapestry on the Hudson, a repurposed historic 6.5‐story building constructed in 1899, was converted into 67 multi‐family, mixed income, residential apartments. Additionally, the transformation included the restoration of a concrete seawall, construction of an elevated green space deck, new vertical transportation systems, repairs to the building structure, upgrades to the building envelope systems, solar and other green infrastructure investments while preserving the historic features throughout the building. Architect: Dave Sadowski – Community Builders Inc.